A new Paso Robles chief just like the old chief? A six-person Paso Robles “citizens’ committee” advising in the selection of the city’s next chief of police includes the man whose recommendation led to the eventual appointment of disgraced Lisa Solomon-Chitty as the city’s first female chief of police. Dennis Cassidy, a long-time veteran who headed the police department until retiring in July 2007, promoted Solomon-Chitty through the ranks to captain. Before he departed, Cassidy championed Solomon-Chitty to replace him. With tacit approval from council members, City Manager James App then appointed her to the post. Solomon-Chitty left her position in March plagued by subordinates’ allegations of sexual improprieties and reports of her questionable, perhaps unlawful, management policies and practices. City officials authorized an investigation into her alleged behavior, but it was not completed when Solomon-Chitty decided to quit her post, and thus its contents have been kept secret by city officials. Solomon-Chitty collected more than $250,000 in taxpayers’ money as she retreated, and publicly blamed the reporting of “an online news service” for damaging her reputation to the point where she was unable to perform her professional duties. Council member John Hamon selected Cassidy for inclusion in the citizen group “because of his experience and background,” said Hamon. Asked if he thought the selected group was representative of residents, Hamon said yes, and then hung up on a reporter. Cassidy did not return phone calls from CalCoastNews. 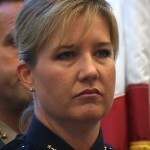 Karen Daniels, chair of Change Paso Robles Now (CPRN2012), also was critical of the appointment. 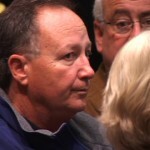 “Dennis Cassidy was ineffective in his stewardship of the safety of the people of Paso Robles. Under his watch, both drugs and gangs took hold in Paso Robles. In my view, it is a conflict of interest that the ex-police chief who helped promote Lisa Solomon be chosen by a member of the city council to be on the panel to assist in the selection of the city’s new police chief,” she said. The advisory group, hand-picked by council members and the mayor, also consists of Vivian Robertson, CEO of the Paso Robles Event Center (appointed by council member Fred Strong); Julian Crocker, superintendent of San Luis Obispo County schools, and Ed Bedrosian, a former Paso Robles police captain (Mayor Duane Picanco); Armando Corella, director of the Paso Robles Housing authority (council member Nick Gilman); and Al Garcia, chairman pro tem of the city’s planning commission (council member Ed Stienbeck). Prior to the selections, the council decided against enlarging the advisory committee to include more representative citizenry. The Advisory Committee is loaded with cronyism, corruption and paucity of character. It is a mirror image of the PRPD. When is the PRPD going to stop covering up for the criminal violence of its Ol’Boy Clique? PR needs a moratorium on government for at least three years until it finds a way to rid itself of the corrupt parasites that are ruining it. Briefly, I will refer to an old maxim “ACTIONS speak louder than WORDS”. So, “no actions” no change in local government. It’s so appalling that Paso Roblans just don’t want to take the necessary actions to change Paso Robles for better representatives for our community. What ever happened to “Change Paso Robles Now (CPRN2012)”? This sort of crap takes place because the people of Paso Robles allow it to happen. The apathy is truly appalling. Unfortunately the citizens of Paso Robles are going to get more and more of what they allow and it’s going to get uglier and uglier. LOL…CPRN2012 has been busy organizing, auditing, questioning, and investigating. We are still here and the entire City is invited to our project. Perhaps I will see you there?